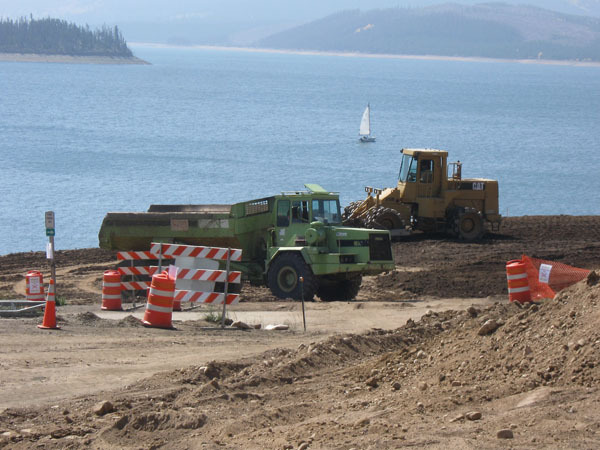 Improvements around Dillon Marina, along with a new portion of multi-use path in Dillon, are under way and on time for partial completion before winter hits. The formerly two-tiered marina parking lot is being leveled out, a process that will be finished before the end of October. Paving will be done in the spring, although the town is still working on next year’s budget, something that will help define the rest of the project, according to town engineer Dan Burroughs. The Crow’s Nest has already been demolished to make way for a new aquatic nuisance species inspection area, which will allow multiple vehicles with boat trailers to wait in line (all have to be inspected before launch) without blocking emergency access to the marina. Burroughs doesn’t know when Crow’s Nest will be replaced; the new structure hasn’t been budgeted yet, he said. Marina Drive is being relocated a little to the west in order to install the new inspection area, and will be tied into Lodgepole Street next spring. That improvement will require about 300-feet of construction on Lodgepole, Burroughs said. The goal is to get the new road, parking lot and inspection area finished before the marina reopens in the spring. The possible replacement of the island and cul-de-sac at the end of Lodgepole Street, and the removal of some trees there, for parking is not currently in the plans and hasn’t been funded yet, Burroughs said. “We’re just finally creating that last link that’s been missing from our system,” Burroughs said.